Kitchen installation specialists, RoJo are based in Farnborough, Hampshire and offer a wide range of home improvement services. 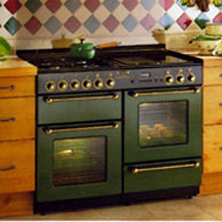 RoJo is a gas installation and maintenance provider, and we service, repair, install and replace gas cookers. Whatever type of natural gas cooker you have, from free standing to built in, high or low level, range or duel fuel, RoJo can supply, install and service it. If you want to convert from electric to gas cooking, as long as your building has a piped supply, RoJo can help. 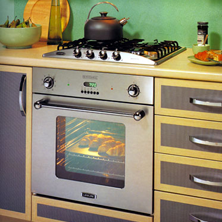 In addition to a gas point, fitting requirements for gas cookers also include a kitchen with a window that can be opened, clearance from overhead units and, depending on the model, an electric point close to installation. 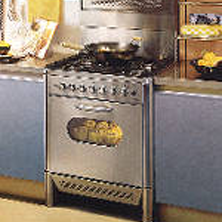 Gas cookers are cheaper to run than electric cookers and do not need much, if any pre-heating. Gas hobs are faster and more controllable than electric hobs but have more individual parts than electric hobs and can be fiddlier to clean. Some gas hobs will feature a glass lid that will automatically cut off the gas supply if it is closed. 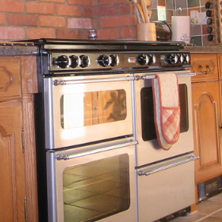 Most gas ovens have zoned heat, which cooks food at different temperatures at the same time. The main principles behind this are that the gas temperature selected relates to the temperature at the middle shelf in the oven. Because hot air rises the temperature will get hotter above this point and cooler below. Gas grills tend to heat up more quickly than the electric grills, but are less likely to have a half grill section for smaller portions. If you wish to discuss the installation, appliance service or breakdown service of a gas or duel fuel cooker, contact RoJo today for more information.